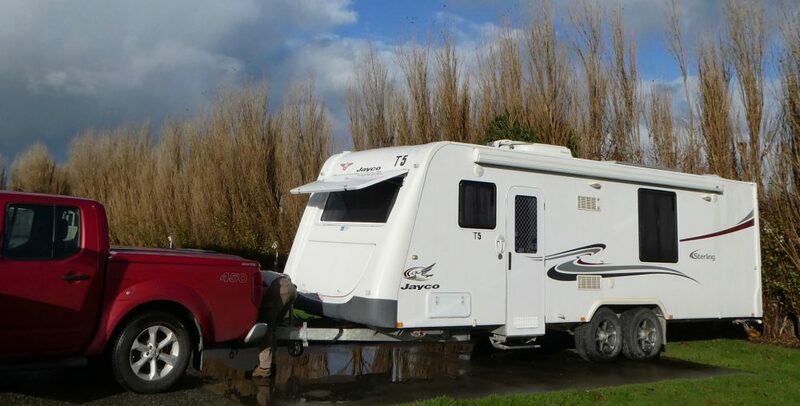 A few days ago we drove to Twizel, collected a caravan which had been brought up from Queenstown, and towed it back to the caravan workshop in Christchurch. I went along for the ride and decided to do a photographic diary. Most of the photos were shot through the tinted windscreen and telegraph poles had an annoying habit of intruding at the wrong moment! After an early breakfast and giving Oscar the cat his insulin, we left home just as it was getting light, on a cold grey drizzly morning. It was too dark to photograph the proposed quarry site (which we and many neighbours are protesting about) as intended. The lights of the ‘inland port’ complex a little further down Jones Road loomed out of the mist. The Ashburton River was similarly gloomy …. After Ashburton we turned inland, off the highway. Almost immediately the mountains came into view beyond the green Darfield plains. It also looked as if the weather was lightening, but there was still much fog and mist around. Geraldine to Fairlie and beyond is one of my favourite drives. The temperature continued to drop after we left Geraldine. It was 8 deg C when we left home, increased to 12 before Geraldine, then steadily dropped again. As we approached the Farm Barn cafe at the top of the hill before Fairlie, the weather cleared again. Time for coffee (and photos in all directions). There’s some new decor in the cafe. …. and to Burke’s Pass, where it was not. Also rather cold! Approaching Tekapo it became very foggy again. It’s the first time in all the times I’ve been past (or on!) the Lake that the entire Lake was invisible. The new pedestrian bridge made for some nice shots; as we were not towing a caravan at that stage, and were making good time, we could stop and take proper photos for once. Despite the weather the car park around the little Church of the Good Shepherd was obviously packed. I felt for the tourists, unable to see the Lake at all. Hungry? Here’s an apple tree. On to lake Pukaki. the mist was slightly less heavy and the outlines of the shore were visible, but none of the wonderful blue colour. Not far to Twizel now. A sudden brilliant beam of sunlight illuminated two trees ahead. could we get closer in time? Alas, no. The caravan we were to collect was waiting for us at Twizel. There was time to inspect the Ulysses tree – it’s doing well, lots of tight buds on the branches. We had lunch at the Musterer’s Hut at Twizel – in the distance to the left of the red ute (ours) and caravan 2 photos back – a quirky place, designed and decorated to look like a rough and ready hut but actually cosy and warm with double glazed windows, corrugated iron ceiling hiding good insulation, two roaring fires – and great food. Highly recommended. What’s that in the gap in the clouds? A bit of blue sky over one of the canals. But we couldn’t stop with a huge caravan in tow. By the time we got back to Lake Pukaki the weather had closed in again. Mt. Cook – Aoraki is somewhere in the mist about where the little bush is pointing. And then it cleared yet again, on the plateau en route back to Tekapo. Still lots of mist as we headed back towards Fairlie. We stopped at the Dog Kennel Corner to let Penny out for a run. And a few good photos for a change. The weather continued to be reasonable the rest of the afternoon. The view from the Farm Barn Cafe on the hilltop was vastly different this time. But we didn’t stop. Although we soon had to, and wait about 15 minutes while some repair work and/or tree lopping was done on the hillside beside the road, just out of sight around this bend. Sun getting lower, temperature dropping ….. by the time we approached Geraldine it was all grey again and starting to drizzle so I stopped taking photos. We reached Christchurch in good time to deliver the caravan to the workshop, then a fast trip home to light the fire, feed the animals and give Oscar his injection, and finally feed ourselves. Dave drove about 570 km in about 8 hrs with a lunchstop, two coffee breaks and refuelling. This entry was posted in Uncategorized by ciotach72. Bookmark the permalink. Thank you for your new post – always enjoy reading of your adventures. Photos are especially interesting and always educational. A pat for Oscar and Penny. That’s some trip!!! Dave will have needed a good night’s sleep after all that driving, and perhaps a whiskey or something similar. I especially loved the snowy topped mountain pics. And that interesting cafe you stopped at, must remember that one for next time we travel down that way.